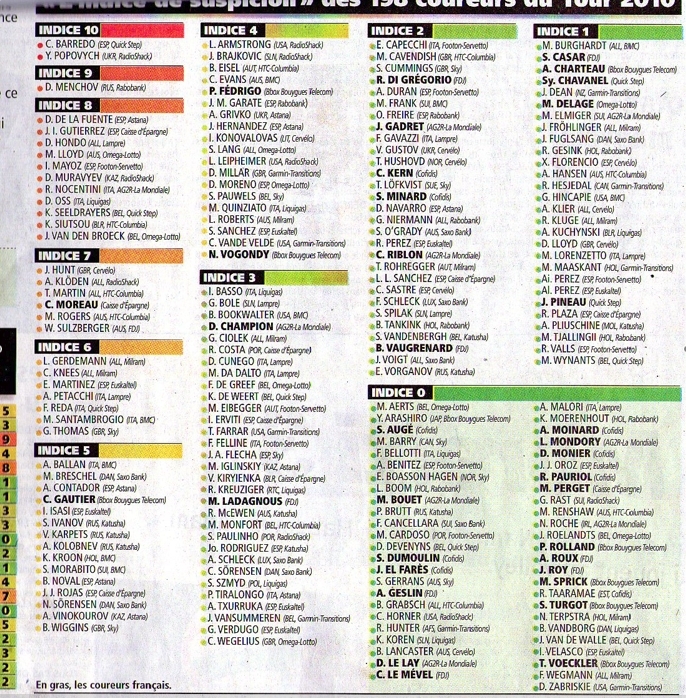 That’s the list from this morning’s L’Equipe. It shows an internal UCI ranking of riders according to levels of “suspicion” relating to strange values gathered under the bio passport scheme. The higher the score, the greater the suspicion. The list was formulated by the UCI on the eve of the 2010 Tour de France. Suspicion’s a particularly nasty sentiment. Finger pointing, accusations, denunciations, whispers and more are all ugly because often they’re quite wrong. So take the list above with more than a pinch of salt. There’s no direct link with doping, this is just an internal score used by the UCI to help testing. But both the list and the leak raise serious questions. The anti-doping budget is significant but not huge. Given limited resources the UCI, the UCI has to target testing where it counts. Some riders and teams get tested more than others. Put simply the likes of Astana and Radioshack get more knocks on the door than others. Unfair? Perhaps, but the testers believe they need to watch some more than others. I welcome this intelligence-based testing, it makes sense. The scores are based on data gathered from the bio passport scheme. Interesting scores, strange numbers and more give rise to higher scores. But riders are informed if the numbers are off a bit and can offer an explanation. Remember that if riders have strange numbers the UCI can sanction them. We’ve seen riders like Franco Pellizotti banned after the Italian presented strange numbers during a series of blood tests. So these scores are a warning light, an alert to for people to be vigilant. But it’s not proof of anything. Given the UCI’s information from the bio passport it shows how the UCI can’t afford spats with agencies like the AFLD. The UCI has intelligence on riders and so it’s useful to exploit the data, to certain monitor riders more than others. Another bit of good news is that so many riders seem beyond suspicion. L’Equipe says the list is “reassuring”. I agree, go back 10 years and you’d find the majority of the bunch with a strange haematocrit count, a distribution of numbers unique to the pro peloton compared to the wider population. This isn’t to say everything is fixed, some are just resorting to new means. But there’s progress. Riders seem to be openly scored. This is explosive because it’s all to easy to join dots. Information like this needs to be held securely and anonymously. It’s based on private medical data and potentially legally sensitive. There should not be a way to compile the list of every rider from the 2010 Tour de France. If the UCI wants riders, teams and the media to support the bio passport then it needs to manage it with care. Who leaked? Someone close to the UCI or WADA had access to this. I can imagine L’Equipe getting flak for printing this but that’s what journalists do and the newspaper offers words of caution. Why was the data leaked and who gains? Things will be ugly. The internet allows rumours to spread fast and accusations to fly. But it’s not new. There’s a gripping French film called Le Corbeau that deals with accusations and gossip. Filmed in 1943, the film was banned. Even if you don’t understand French, you can probably pick up the atmosphere of distrust in the trailer above. It tells of anonymous letters denouncing various people in a small village and soon the locals start pointing fingers, within time the mistrust turns into violence. The film is an example of just how poisonous suspicion can be in a small community. The saving grace today, if there is one, is that riders – if curious to check their own score – will be united it denouncing the leaks and anyone making quick connections about levels. The UCI has already attacked the publication but for me that’s phoney, it’s like blaming a shark for biting as a newspaper will always look to publish information like this and the paper has accompanied the index with words of caution. It’s a shame the UCI communiqué doesn’t apologise for poor data handling. Hopefully the storm will blow over but it chips away at the reputation of the bio passport. For me the biggest question is who leaked the information and what do they gain? Oh wow, after the UCI I think Gazzetta will be the least pleased about this. L’Equipe on the lips of everyone at the Giro! Great post, thanks for the pic! I can only agree – the danger in this simply lies in the name of this index – “index of suspicion”. Unfortunately it propably means that a lot of people wrongly will end up being suspicious to riders with high numbers! Whilst part of me can understand the riders’ collective anger about this (at least if Twitter is an accurate barometer of rider feeling), I also think they need to reflect a little on why the UCI have to compose a list like this. Hunter, Cavendish et al are riding a race where Danilo di Luca is being welcomed with open arms, despite being twice banned for doping offences. Maybe if they channeled their anger in his direction the need for such a list would be reduced. I just cannot believe the fact that this has been leaked! The UCI are an absolute disgrace and totally inadequate. They are nothing without the riders, teams, sponsors and fans and they certainly want to seem to drive a wedge between them. Just to add the fact they have a list is not a problem, just the fact they have let it be leaked. Thank you for this, I always appreciate someone taking the time to formulate a measured response. A leaked document like this is highly suggestive without actual proof or offering further understanding or documentation. It’s all too easy for people to get worked up and start pointing fingers. It doesn’t feel especially helpful beyond pointing out that some riders might be targetted more than others (which we already knew). I would be interested to know who gained by leaking this though. Interesting that Wiggo scores higher than Armstrong and Millar here. If any Sky rider was to be placed that high you would expect it to be Michael Barry (in the lowest group in tha table) given what Landis said about him. Interesting? Yes. Does this muddy the waters even more and confuse the issue? Most definitely. Be careful not to point fingers, even at the UCI. Note that if the governing body managed the list, it was also shared with WADA. We don’t know who leaked this, it’s quite probable this is designed to embarrass the UCI. For those thinking it embarrasses the Giro, note it’s on the eve of the Tour of California, an event closely associated with ASO and L’Equipe. All the same, this is such sensitive data that it should have been stored in a foolproof manner. Crommy: for sure some riders are doping. But if we start pointing fingers here then it won’t lead anywhere. I know one of the riders with a 6 for example has a valid medical condition that might explain things. And, for want of a better word, some of the “best” doping in recent years has gone undetected thanks to sneaky doctors and novel techniques, a zero is no guarantee. In summary the list is useful for testing but relying on it for anything more is fraught with risk. The last thing the sport needs is a fresh bout of infighting and finger-pointing. For me the story is in the leak itself, the poor data handling and the future of the bio passport. What does this list say after all? For the high scores, one may argue that the riders involved MIGHT some way be involved in using ‘old school’ performance enhancing drugs. But what about the riders with low scores? It may be indicative of their ‘good’ behaviour. But it could just as well mean that these guys are one-two steps ahead of the rest, by resorting to newer-generation drugs. Given the complexity of biological systems, I would like to know alot more about how the category’s are assigned; As has been said being in the ‘0’ group is no proof of being clean due to more effective doping methods. tbh, I might even take this one step further: if a rider always has the same results I would ask if this in its self is not abnormal, as blood values could be affected by so many different factors- ie training load, diurnal rhythms, falls and other physical injury, etc etc. it would be unlikely to NEVER have an ‘abnormal’ result. Leaving speculation appropriately aside, it would be very interesting to read an analysis of this list based on known facts. A little research, if one has the time, could correlate the list with riders who had past doping sanctions, keeping in mind that a high suspicion rating still does not mean doping. Even more telling, especially regarding the BioPassport regime, would correlate the list with any riders who have since tested positive or received sanctions during the past year. How did the teams fare? Does anyone feel this is relevant? Or countries? The French riders seem to accumulate at the lower end, at least at first glance [since the names are emboldened]. If I can find the time, I’ll crunch the numbers and research 2010 doping sanctions. I think asb has hit the nail on the head there. From what I understand of the passport, riders who consistently post ‘flat lines’ are as suspect (probably more so) than those with fluctuations. It’s a minefield, and the leaking of such a list is highly irresponsible. It’s somewhat reminiscent of the witch-hunting that goes on the NHS when journalists get their hands on raw data concerning the activity of units/individuals and create a sensation out of data that has so many caveats, it’s barely worth looking at. Rider with a 6 and a valid medical reason, Geraint Thomas and his “not having a spleen”? Surely in statistical terms it’s the outlying values that are the most suspicious? I.e. if you’re scoring 1 or 9 you’re outside the majority of cases and would be in my book a more troublesome explanation. if someones got the time or energy – i haven’t – would be funny to see if the “2011 ToC starter” average is above the “2011 Giro starter” average…. Wiggins and Vinokourov on the same part of the list, I can’t imagine Wiggins is particularly pleased! – This is very far from “rumor”. This list is based on a careful assessment of the biological passport and probably blood and urine testing. Sure, it is not based on sufficient evidence to hold out in court (otherwise, I hope the UCI would take up the cases), but apparently, on a body of corroborating indices. Btw, the article is much more nuanced than just a blunt list. – As Crommy noted: 0 and 1 mean that there is pretty much no suspicion of doping (not necessarily an abnormally flat profile but more a normal profile). For 2,3 and 4, there are some vague informations, with sometimes an isolated abnormal value, but nothing very serious. Starting with 5, the suspicions are much more specific, with some very affirmative comments on some of the riders. Above, for scores of 6, 7, 8, 9 and 10, we are talking about riders whose biological passport has already been the subject of a report by the UCI antidoping experts, without the rider being suspended. Some of those riders are the object of very serious allegations, such as recurring abnormal profiles, enormous variations, identified doping products and method of administration, etc. So, bellow 5, probably ok. Above 5-6, probably not ok.
– And let us be serious for a second. Nations with the most suspicious riders: ex-Soviet block, Italy, Spain. Nations with the least suspicious riders: France, Switzerland, Netherlands. Teams with the most suspicious riders: Astana, Radioshack. Teams with the least suspicious riders: Cofidis, FdJ, BBox, AG2R, Garmin, Cervélo. Some of the most suspicious top riders: D.Menchov(9-HumanPlasma), A.Klöden(7-Freiburg Uni-Klinik), A.Petacchi(6-Mantoue), A.Ballan(5-Mantoue), A.Contador(5-Positive 2010, Puerto), A.Vinokourov(5-Positive 2007, Puerto). Is anyone seriously surprised? – On the other hand, it confirms what everyone is saying: riders are doping less in the peloton (only 27 out of 198 above 6, the average being around 2,434). Most of those who dope probably rely more on micro-dosing (EPO, testosterone, 150 mL blood transfusion). – Who benefits from the leak? The French cycling establishment, most certainly, which is why it is published in the ASO newsletter. Sorry, I meant l’Equipe. And people who are serious about anti-doping and fed-up with the hypocrisy. Thank, Raphbxl, those were the stats I wanted to see but didn’t have the time to crunch. Nothing surprising, but rather they confirm the relatively obvious. Regardless of who leaked the information, this breach is particularly troubling, particularly for an organization that recently claimed they couldn’t release confidential medical information to French prosecutors. While targeted enforcement is typically an effective law/security enforcement strategy, how far should this list be disseminated? If the UCI is sharing this with WADA (or vice versa), is WADA sharing it with their affiliates? How does the existence of this list effect the supposedly random nature of in-competition testing? Do race commisaires and sample collectors have access to the list? The testing of collected samples are supposed to be blind. Does the existence and sharing of this list affect the actual testing? Consistent leaks to French media provide further indications that the anti-doping system lacks security and integrity, and the list further shows that WADA and the UCI’s relationship may be too cozy. This list is a breath of fresh air, thanks for posting it. Does someone have a link to the article? (Don’t think l’equipe posted it). And Kudos for the movie, that was fun! According to L’Equipe, this list was provided to all officials in charge of antidoping during the Tour (so UCI only) and to independent observers from WADA, so that they could assess the efficiency of UCI anti-doping targetting. One more thing: before everyone starts patting themselves on the back about the fact that this list is really “good news” since it would seem the mojority of riders are clean(ish), look back and check how many grand tour contenders are in the categories from 4 upwards (answer: a lot). How many contenders below? You get my drift: to win a grand tour, you must dope. No progress there. If I can add something else to RaphBxl comments, it’s interesting to look at the teams who have very clear anti-doping stances and see where their riders place. Specifically, 2 of the very high profile anti-doping teams, HTC have 3 riders in the 7 and 8 buckets whilst Garmin have none. Interesting reading in that the “top 2” are guys that have never tested positive or been banned. Look below them and you have guys who have been banned or pulled from competition due to previous bad behaviour. Really makes you question the effectiveness of drug testing and if these rankings are based on biological passport data then why has nothing happened? B) Armstrong stopped significant doping activities during his comeback sufficiently enough as to not arouse suspicion. But hey – anyone surprised that athletes from the old Soviet block seem to attract higher numbers on this list? Maybe we need to ask some former East German swimmers what they think. How can Contador be ranked a 5. Considering he tested positive for Cenbuteral (sp?). That seems pretty “suspicious” to me—maybe not the UCI. ***I am assuming (which may be unfair) due to the breadth of circumstantial evidence with Mr. Armstrong that he has during a large portion of his career resorted to doping to enhance his performance. @ RaphBxl OK, but standard in-competition testing protocol is supposed to encompass stage winners, category leaders, and random. Random selections are supposed to be independent of the UCI and the Commisaires (selected randomly from the start list by the anti-doping authority in charge of controls at the event), thus the UCI officials in charge of officiating the race should not have had any access to this list. If someone is doing targeted testing at events, it makes one wonder how random the selections truly are, unless the targeted testing is in addition to and independent from the standard in competition testing. Again to me it seems that the UCI & WADA/affiliates are too close. To establish and maintain systematic integrity, the UCI should insist on testing, and then get out of the way, allowing WADA do their job. If WADA then reports back positive test results or suspicious results vis-a-vis the biologicial passport, then it must up to the UCI to begin the appropriate disciplinary or intervention action. If the UCI fails to act, then WADA must have a process to otherwise report/enforce their findings, perhaps through CAS or IOC. @Oliver – I’m reassured by where Cancellara places, “proves” you don’t have to dope to be a superman. The list could have been leaked by the UCI to discredit the teams threatening a breakaway. In general, I attribute a lot of what’s wrong in cycling to the UCI, those damn bureaucrats. Interesting that HTC had one 8 (Siutsou) and two 7s (Martin, Rogers). In fairness, there really is no such thing as a “foolproof” system. There is always someone who has access to the data and electronics fail – people and systems are fallible. It is easy given our perception of the UCI to imagine that riders’ medical data could be lying around on office desks waiting to be scooped up by L’Equipe. But until we know who actually perpetrated the leak, we won’t really know either the motive or the seriousness of the breach. @Miho & others: FYI – There has been a bit of number crunching (by team and by nationality) over at cyclingnews. Great, now we will have insider trading to deal with on the contract market. I completely agree with your perspective on the tenderness of such an issue with regards to a “small” community of exceptionally talented athletes. I’m having trouble getting past any reason for this inappropriate gesture – just another stupid, publicity stunt – a “bruise” that could possibly catch certain attention; however, when you scan down the names and find Jens Voigt there, all legitimacy seems to dissipate, regardless of whether or not we can take the info (any correctly recorded, athlete data) to the bank. Don’t chalk me up as a naive American – when I see the words, “Jens Voigt” on any suspecting, doping list, I simply flip the page, take a sip of my coffee, and carry on. Nice try, l’Equipe. Please just stick with the race coverage. Inrng: thanks for the balanced approach to this topic. I’m appreciating some of the really well thought out comments have been presented by others too. From the wide range of interpretations of the list that I am reading just as a result of this post, I can’t help but be aware of how quickly we dehumanize these riders and the potentially damaging ramifications of our collective “interpreting” (myself included!) has on the reputations of real human beings. I’m not sure who “gains” from all of this, but an apology to the athletes for the way this information has been mishandled (by whom is still to be determined) would definitely be in order. I agree with your tone regarding pointing fingers. I believe that in the fight against doping, the UCI/WADA must be strategic in their implementation of their doping controls. Their decisions need to be based on data analysis and not hearsay. I am fine with the fact that there is a list and that there is a ranking system as long as it is kept in house (UCI/WADA) and is used as evidence to support further investigation. Once again, the cloud that surrounds the UCI seems to keep getting darker. The handling of the radio ban, the points system and now this leak. I understand that it may have been WADA or another partner that provided the leak but the UCI as the governing body should have protocols in place to support security and confidentiality. I wonder how high the rankings (10+, 15, 20) of guys who have been sanctioned under the bio passport would be? Hard to believe the guys at the top of these rankings have yet to be sanctioned using this method based on the description of how much manipulating their blood profiles indicate. I still find it hard to believe there were no positive tests during 2010’s TdF besides “Il Pistolero”, especially when things were so different when AFLD ran the dope testing a few years earlier. Did the cheaters get so much more sophisticated and clever in the interim? I read somewhere an opinion that “Hot Air” himself had this ranking list leaked to damage the reputations of those supposedly behind the rumors of an NFL-style cycling league. But while it may make some look bad, it does nothing but bolster the anti-doping credibility of JV’s squad. I wish there was some way they could exclude riders with high scores on lists like this….they’ve done it with less “evidence” in the past. What did they actually have against “The Killer” when the TdF excluded him awhile back? Of course NOW there’s a lot, but what was public back then seemed rather flimsy. Any way you slice this it’s a mess and shows pro cycling still has a LONG way to go in anti-doping efforts. Each time some improvements seem to be made, a new scandal comes along to make you wonder if things really are getting better? Thanks for all the comments, I’ve been following them all during the day but not jumped in. – the numbers are apparently higher if someone rides unusually well. The UCI briefed the teams on this so the score goes up if a rider suddenly starts doing well. – the WADA “Independent Observer” report did ask why the UCI wasn’t testing riders with the highest scores that much. We’re no closer to an answer. – nobody knows who leaked it but clearly the UCI gets embarrassed and the bio passport scheme is hit. Ask yourself who is out to get the UCI or the passport. “Ask yourself who is out to get the UCI or the passport.” Hmm, if the “UCI briefed the teams” does that mean that they are aware of the list and what it entailed? If so, are the people behind the break-away league involved in the leak? I seem to recall reading on Friday somewhere that testing prior to and during the last 3 Grand Tours (i.e. not during the spring or autumn classics period) was taken into account for this pre-Tour 2010 list. Can anyone confirm that please?